In terms of regional economy, the Kootenays have continued to stand out in a positive way. The combination of our robust goods and services sectors, and our thriving resource-based businesses, sets us apart from the rest of the province—and we’re proud of it! 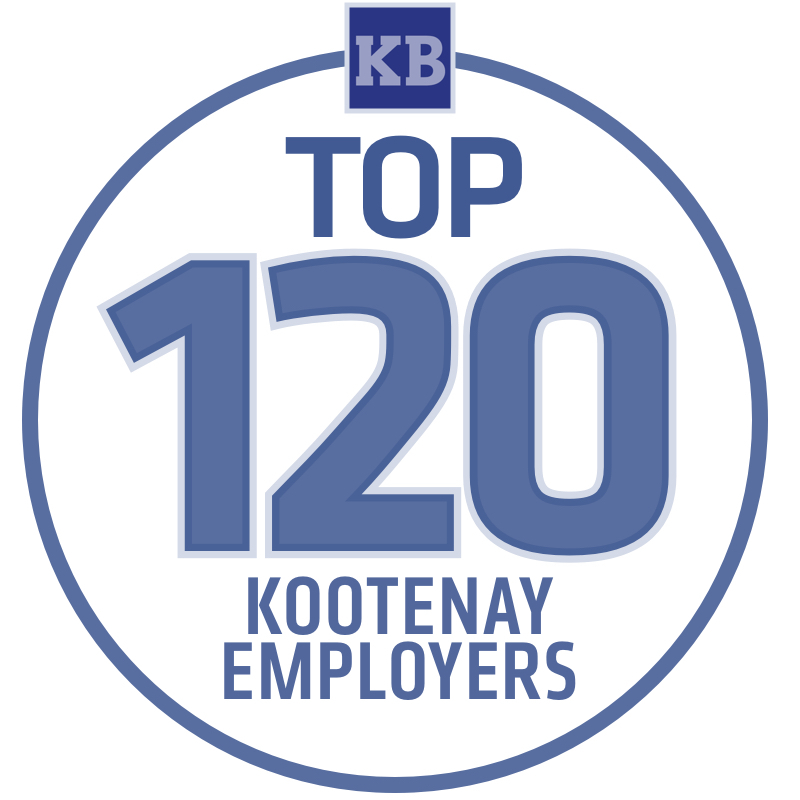 As we do every year, the team at Kootenay Business magazine has put together a list of the Top 120 Kootenay Employers, based strictly on the number of staff members they employ. In a few cases, the numbers reflect peak season only, as certain companies do not operate year-round (some ski resorts, for example). Take a look at some of these leading employers from the East and West Kootenay regions, and visit their career information pages if you’re curious about job opportunities with these reputable companies. 13. Canadian Mountain Holidays LP. Location: East & Central B.C. Job opportunities at Louisiana-Pacific Canada Ltd.
Job opportunities at CanWel Building Materials Group Ltd.
Job opportunities at Downie Timber Ltd.
Job opportunities at Skookumchuck Pulp Inc.
Job opportunities at Roxul Inc.
36. True Key Hotels & Resorts Ltd.
Job opportunities at True Key Hotels & Resorts Ltd.
Job opportunities at Sutco Contracting Ltd.
47. Kalesnikoff Lumber Co. Ltd./Kootenay Innovative Wood Ltd.
Job opportunities at Kalesnikoff Lumber Co. Ltd.
54. Porcupine Wood Products Ltd.
Job opportunities at Porcupine Wood Products Ltd.
Job opportunities at J.H. Huscroft Ltd.
65. RHC Insurance Brokers Ltd.
Job opportunities at RHC Insurance Brokers Ltd.
68. Yellowhead Road & Bridge (Kootenay) Ltd.
71. Maglio Building Centre/Maglio Building Centre (Trail) Ltd.
Job opportunities at Fab-Rite Services Ltd.
75. Transcendent Mining and Mobilization Inc.
Job opportunities at Transcendent Mining and Mobilization Inc.
80. Atco Wood Products Ltd.
Job opportunities at Atco Wood Products Ltd.
85. Boundary Electric (1985) Ltd.
Job opportunities at Boundary Electric (1985) Ltd.
90. Selkirk Security Services Ltd.
Job opportunities at Selkirk Security Services Ltd.
Job opportunities at Unifab Industries Ltd.
Job opportunities at DJM Contracting Ltd.
98. Trainor Mechanical Contractors Ltd.
Job opportunities at Trainor Mechanical Contractors Ltd.
Job opportunities at Fernie Lodging Co.
101. Kootenay Insurance Services Ltd.
Job opportunities at Kootenay Insurance Services Ltd.
103. Box Lake Lumber Products Ltd.
Job opportunities at Box Lake Lumber Products Ltd.
106. Liberty Food Store Ltd.
Job opportunities at Liberty Food Store Ltd.
Job opportunities at Southeast Disposal Ltd.
Job opportunities at Koocanusa Publications Inc.
114. A.M. Ford (Sales) Ltd.
Job opportunities at Canadian Timberframes Ltd. Think your business should be on our list? Email Kootenaybiz and let us know how many employees your business has.